Understanding call volumes can help determine resource needs, and ensure that remote workers are responding to calls effectively and using their time efficiently. Call Waiting allows you to put your current call on hold to answer a different incoming call. Should you choose to disregard the incoming call the second call will be transferred to your voicemail, or another pre-determined destination. The following topics will help you with common Call Waiting-related questions. How do I configure Call Waiting for a User? A. How do I configure Call Waiting for a User? Click the User Features tab and select Call Waiting. 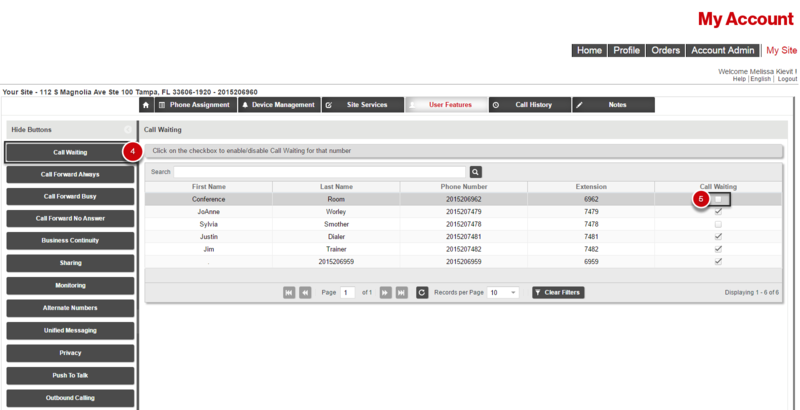 Check the box next to the phone number(s) you would like to enable call waiting on. Note: Any end user with My Phone access can override this configuration.